For the past month or so, I’ve really been craving all sorts of really green or otherwise vibrantly colored puréed soups, even more than usual. I’ve been dumping bunches of greens and herbs mixed with broth and a gently cooked base into the blender and enjoying watching it all come together in no time. On the other hand, I’ve been adding all sorts of texture and flavor pops over the top of the silky soup, like garbanzos or lentils, spiced seeds, and this genius savory pistachio granola, which kicks up just about anything it’s added to to the best degree. The granola is a base of pistachios, oats, rosemary, thyme, and fennel, but then I got the idea to make it extra clumpy by adding a little chickpea flour. It adds to the savoriness and makes for extra clump. Other than the flavor, which has really been enhancing my winter meals, what I really like is that I’ve made a granola colorful without adding any dried fruit! It has lots of little hints of green from the herbs and pistachios. 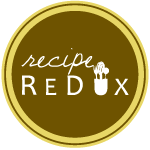 For the past few years, I’ve repeatedly heard the terms phytonutrients and antioxidants thrown out and I’ve even used them myself when teaching about nutrition. I’ve generally stuck to the basics and encouraged simply making meals colorful and diverse. One of the reasons we hear the advice to eat the rainbow is because plant foods that are really vibrant and colorful really do have more nutrients. They’re the kind that in the nutrition world we call phytonutrients, and we tend to think they’re really healthy for us. These plant nutrients are nature’s way of toughening up plants to survive harsh conditions, and it just so happens that when we eat them, those benefits are passed on to us. There are many different types of phytonutrients but many have lots of antioxidant ability, meaning they fight inflammation and free-radical damage from normal cellular processes, as well as a modern lifestyle that’s often less than ideal. The more colorful, whole foods we fit into our everyday meals, the better for our short and long-term health. And all those lovely green pistachios? They are actually known as The Colorful Nut™. They help you snack colorfully–because pistachios’ green and red-purple hues come from a type of phytochemical that is rich in antioxidants. 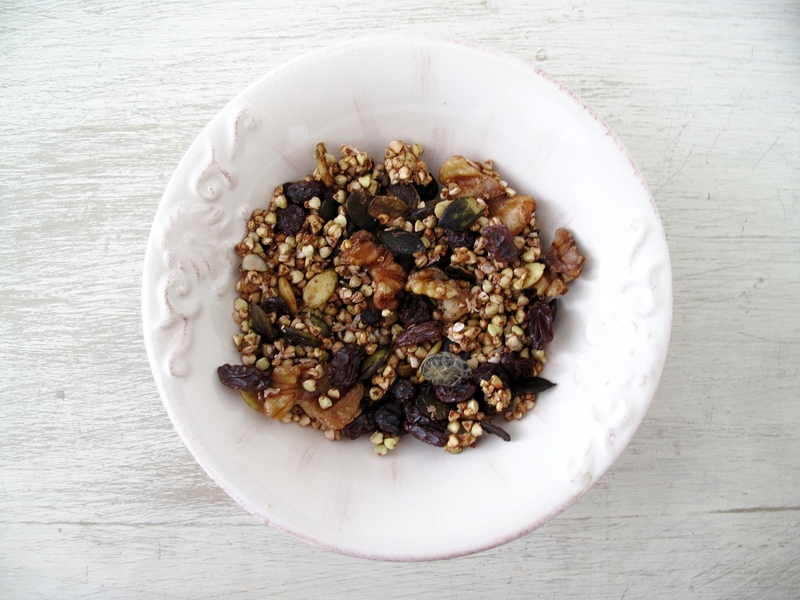 In addition to toppings for soup, I’ve been adding this granola to basic power bowl type meals and to winter salads that need a little spark. How are you making your winter meals that extra bit colorful? Add as much or as little as desired to top meals, or even serve a hefty handful or so with some plain coconut yogurt for a nice savory sweet snack. Preheat the oven to 300 degrees F and line a large, rimmed baking sheet with parchment paper. In a large mixing bowl, combine the pistachios, oats, puffed rice, chickpea flour, fennel seeds, herbs, and salt. In a smaller bowl or liquid measuring cup, whisk together the olive oil, honey, and about 2 tablespoons water until combined. Pour the wet mixture into the dry, and mix well. Add about 2 additional tablespoons of water as needed. Transfer the granola to the prepared baking sheet and use the back of a big spoon or spatula to spread it out into an even layer. Bake for 35 to 40 minutes, rotating the pan halfway through, until golden and fragrant. Let the granola cool completely in the pan to keep the clumps intact. 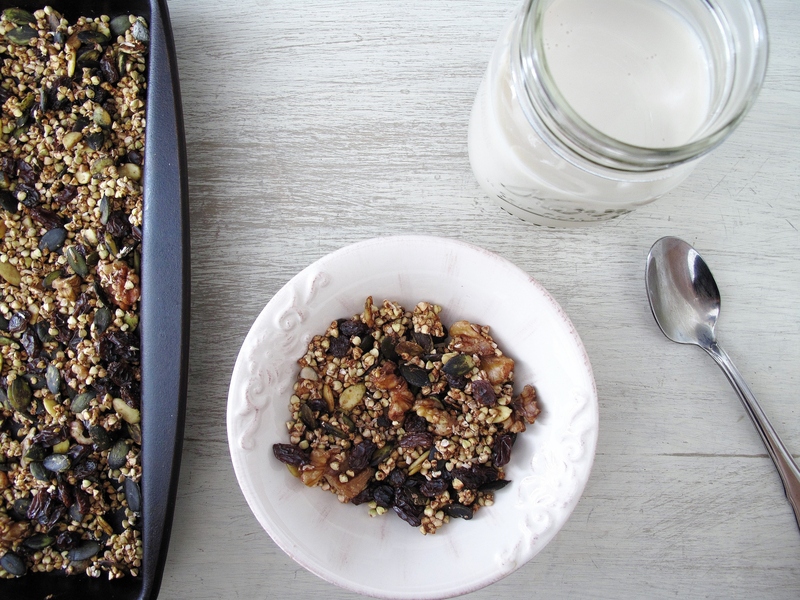 Store the granola in an airtight container at room temperature for up to 2 weeks. Difference Between. (2015). Difference Between Antioxidants and Phytochemicals. The Institute for Functional Medicine (2015). Phytonutrient Spectrum Comprehensive Guide. I listened to a disgruntled parent on the phone yesterday. Because she was disgruntled about something completely unrelated to me, she was quite open with the details of her discontent. I listened to a couple teachers rant last week. In what started as a discussion of what I could do for their students, our meeting soon became what I could do for them in that moment, to be a good ear. I listen to students in my high school group share their insecurities almost every Wednesday and Friday. Their fears and self-doubts are usually thrown into the middle of sentences so subtly that if I weren’t paying close attention, I might miss them. When I was teaching, I regularly had students come into my classroom to sit and talk at me before or after school, to share their tough lives beyond the school walls, to ask me personal questions that I wanted to feel comfortable enough to answer sincerely because I knew they needed an adult to look up to and have their back. These are not isolated incidents. From day to day, I listen to people share feelings of frustration, of isolation, of shame. Certainly, not everything I listen to is negative. I hear plenty of good experiences and fun stories too. But I hear the tough ones more loudly. Sometimes in those circumstances, I offer my input. More often, I prefer to listen or ask a question or two to keep from having the conversation come back on me, to swirl back around to how I am doing. I remember growing up that it was often stated to me, no one likes a complainer. No one wants to hear the negativity. And I think that is true. But we also need someone to hear us, especially on the days that don’t go so well. In my own home, I’m often told that I’m not a good listener. I cringe each time I hear that statement and I immediatly wonder how, if I’m so terrible at listening to the one that loves and knows me best, can anyone else feel like I’m good enough to confide in? We so often want to shut out the negativity, to cut off the complainers mid-vent because we know just how to fix their crazy, mental, nutty lives. I am a complete victim of this in my own home. I flap my wings all over William’s sharing like a distraught mother bird and I manage to cut him off mid-sentence repeatedly with unhelpful questions because if I’m busy focusing on fixing him there is less room in my crazy brain to focus on what is wrong with me. When I take a step back and give myself a break, just as I so often give everyone else one, I realize we are all just trying to figure out how to live and be and manage ourselves in this experience we’re given. And many of us are struggling daily through life’s heap to peel back enough layers—in a conversation, in a relationship, in ourselves—to find the voice that is ours. Each one of us has one. Each voice is distinct and has something to say. Each voice deserves to be heard. But it requires the act of listening. Chalk it up to roots that run real deep to the British Isles, but I’m in the habit of enjoying teatime around 4pm as often as possible, complete with a hot cuppa and snacks, and all the better if there is good company and conversation to be had. Growing up, I always ate a bowl of cereal as a snack on days I came home right after school. To this day, I favor crunchy cereals and fruit rather than the traditional mid-afternoon sweets. Today just happens to be National Nut Day. I’m not acutally sure if the day is meant to celebrate all the nutters like me, or if its more of a day to enjoy eating nuts, but the Recipe Redux is celebrating with a nutty theme this month. So it was timely that my garden-neighbor handed me a big box of fresh-off-his-tree walnuts last week. I contemplated making all sorts of elaborate walnut concoctions. But then it was teatime and I was out of crunchy cereal. So I made granola. 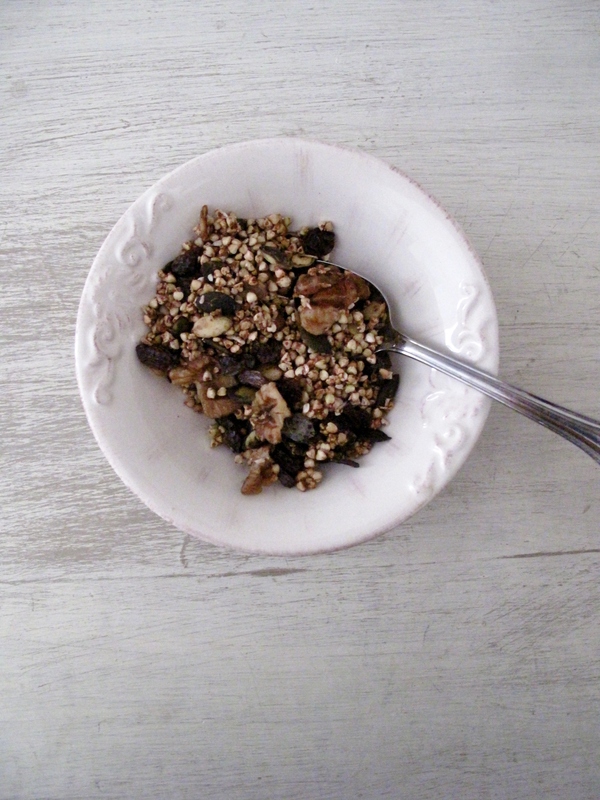 This sprouted buckwheat granola is inspired by a completely raw, sprouted one that I purchase in tiny amounts at my local co-op as a treat. Sprouting seeds, nuts, and grains helps them to release enzyme inhibitors which make them more difficult to digest their beneficial nutrients and makes them more nutritious to eat. Making sprouted granola in a food dehydrator is the best way to make sure those released nutrients are still around in the final product. I do not have a food dehydrator though so I baked my batch in the oven at the lowest possible setting overnight. If you want to add a little honey or maple syrup in the mixing process to sweeten this up a touch more, go ahead. I find the applesauce and raisins to be lightly sweet enough. 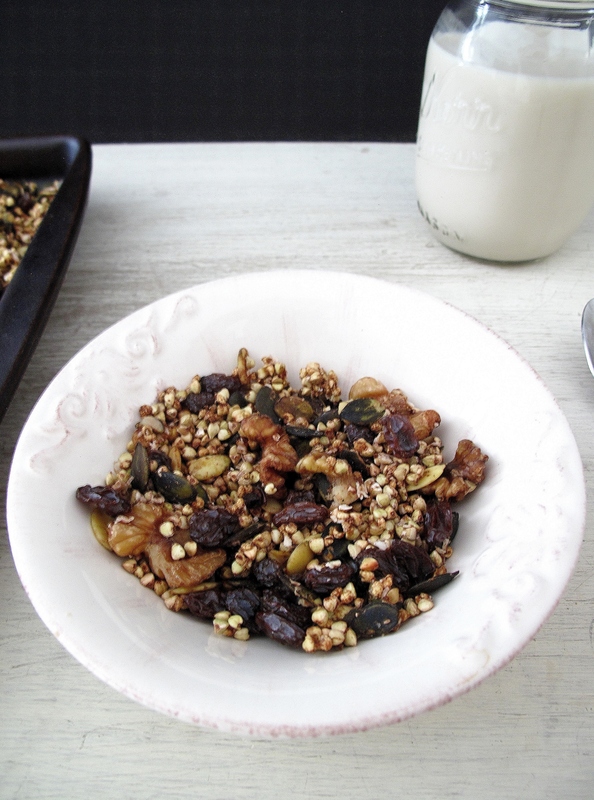 Soak the buckwheat in a large dish for 6-8 hours or overnight. Drain and rinse well until the water runs clear and all the slime is gone. Drain thoroughly. Return the buckwheat to a large jar and cover with cheesecloth, a thin towel, or paper towel, and set upside down. Rinse at least twice per day until it just starts sprouting, about 1-2 days. Meanwhile, soak the nuts and the seeds in a jar for 4-6 hours. Rinse and drain them thoroughly. On a large baking pan, pour out and mix the slightly sprouted buckwheat, soaked and rinsed walnuts and pumpkin seeds along with the remaining ingredients, except for the raisins. Set the pan in the oven at the lowest possible temperature setting and allow to dry overnight for 6-8 hours. Remove from the oven, cool to room temperature, and then stir in the raisins.